The overgrowing business pressure and constant fear of downtimes owing to the dependency on in-house IT infrastructure, is driving the organizational Heads to investigate, understand and if possible, invest in secure Cloud Technology like MS Office 365 and derive potential gain to their businesses. Office 365 is one of the most popular and most deployed Cloud application, to the extent that almost 20% of Enterprise employees use at least one Office 365 app. However, migrating to MS Office involves acquiring the necessary certifications, selecting the migration process, and reconfiguring the Outlook user-profiles. The long list of steps may create confusion. Fortunately, an easy migration method is available, therefore, it is better to weigh the pros and cons of migrating to cloud app. Does the organization need Office 365 Migration? The vest first question is “Do we need Office 365?” Analyze the features – what does it offer; is it financially viable; the strategic reason for change; and of course the potential gains. Next, weigh the risks and restrictions attached with migration and compare the on-premise infrastructure to understand the full scope of migration benefits. A key aspect of choosing the option can be the huge amount of cost savings. Migration will let-go the huge cost involved in updating the infrastructure and maintaining other resources. Understand and compare the cost of maintenance of Office 365 accounts as well as on-premises Exchange and then decide. Though there are three models of Cloud services – SaaS (Software as a Service), PaaS (Password as a Service), and IaaS (Infrastructure as a Service). Out of the three, www.outlook.com works on Software as a Service model. The hardware, and operating system are owned and managed by the Cloud Service Provider thus reducing the administrative responsibilities of the user as the access to these elements is not available. Authorized users can access the application and there is same user interface for all users. Discuss the data location as you must be aware of the geographical location. Make sure that you control your data, have full access to its storage location, and is backed-up at regular intervals as backup replication service is crucial for Outlook in an organization. Insist on resilient, highly available environment for effective disaster recovery. Understand and analyze the SLA offered; the impact of these SLA on your customer contracts, and the compensations offered in case of SLA-breach. Migration needs proper planning and planning includes the list of infrastructure requirements. To start with, you will need two servers – one with Active Directory Federation Services to identify the management of activities between the two environments, and the other to facilitate smooth migration of mailboxes. A small organization can use a virtual server as migration server but this option may create problem in large organization. Check the Network, Hardware, CPU, RAM, Disks, MRSProxy requirements to continue with uninterrupted migration. Assess the time needed to get the infrastructure migrated to the Cloud. A downtime is required to migrate the current Outlook user accounts, as hosted on Exchange server to Office 365. Consider the time taken to resolve the issues with the new IT infrastructure and build. Ensure realistic timelines. Moving from on-premise Exchange to Cloud Office 365 will certainly impact the current infrastructure, however, the best approach is to accept the shortcomings and work to resolve the problems as and when they arise. Though change is inevitable, the impact of potential change in bandwidth utilization, data transfer, and cost of monitoring and managing Office 365 services should be considered. Policies and Certifications required for smooth transitioning are important. Buy these before and starting the procedures to ensure smooth processing. Secondly, check the Outlook versions for users. Microsoft recommends Outlook 2010 or 2013 for Office connectivity and sometimes, even 2010 requires manual configuration. The best way to test some users before final migration to anticipate any connectivity issues. Continue with the smooth transition by preparing for local Exchange server deployment. Ensure that Exchange server configuration is properly configured. Microsoft provides a tool called as Office 365 Health, Readiness and Connectivity Checks tool to conduct readiness aspect and readiness assessment. The key element of successful Cloud migration is to ensure that the resources have the right skill to analyze, design, implement and manage the migration procedure. A small implication may hamper with smooth transitioning. This situation can be avoided with test-based migration. The easiest way to migrate is to create a few dummy accounts and migrate these accounts as test users. A test-based migration highlights the implications which you can overcome without disturbing actual users. Delete these dummy accounts and migrate actual user accounts with ease. Microsoft supports Migration when the Exchange server version is Exchange 2007 or higher. Organizations running on Exchange 2003 may upgrade their Exchange to a higher version before migrating to Office 365. Older versions of Exchange server can pose significant migration challenges. Create a migration plan. Specific migration tools are available in the market to perform easy migration. In fact, Microsoft also offers some tools to migrate from Exchange server mailboxes to Office 365. Supports MS Exchange server 2016 / 2013 / 2010 / 2007 / 2003 / 2000 & 5.5. Multiple EDBs are migrated and hence takes lesser time for migration. Users have option to create an updated backup by saving files in PST and other formats. Migration from Exchange server to Office 365 takes time, proper planning and right use of resources to have least downtime and maximum returns. 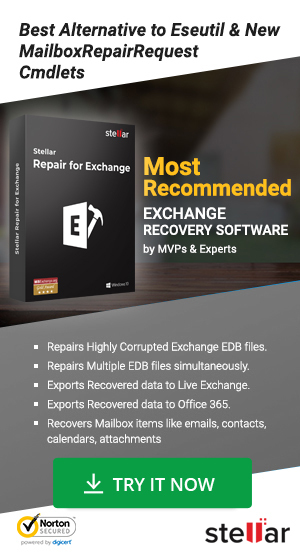 Stellar Converter for EDB software ensures that all mailboxes are migrated directly to Office 365 including all mailbox components.